76-3530 Units: 55 gram jar Use CMC Powder the same as you would Tylose or Gum Tragacanth. CMC improves strength and reduces dry time when used in gum paste. It makes a product that is pure white in color. Can also be used in baked goods to improve the quality and texture. Add 1-2 tsp. of CMC to 1 pound of fondant for a for a firmer, more elastic product. 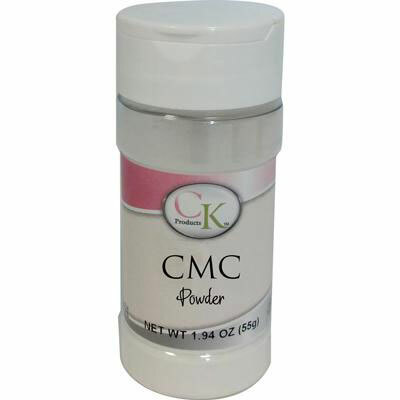 Use CMC Powder the same as you would Tylose or Gum Tragacanth. CMC improves strength and reduces dry time when used in gum paste. It makes a product that is pure white in color. Can also be used in baked goods to improve the quality and texture. Add 1-2 tsp. of CMC to 1 pound of fondant for a for a firmer, more elastic product.